As TV viewers, we become connected to shows, building relationships to storylines and characters that end abruptly when a show is canceled, often without any type of closure. For fans of the medium, the two weeks in May when broadcast shows learn their fate are an emotional rollercoaster. In the past, this has been a moment when fans have rallied to save their show, working to overcome the perceived lack of audience interest by buying Subway sandwiches in support of Chuck or sending peanuts to CBS to protest the cancellation of Jericho. In both cases, fans made the lengths of their fandom visible to networks, translating fan communities from message boards and nascent social media platforms into terms the network respected: dollar signs. By spending money, fans turned the time they spent talking about the show online into something networks valued, in the process convincing them that the shows represented a sound financial investment. Things are different in 2015. Fans are still likely to rally around a troubled show like NBC’s Constantine, but they do so in a way that is now apparently appreciated by the networks. When they tweet about the show and use the #Constantine hashtag, they’re doing what the network has been asking them to do all season. By putting hashtags on the screen, encouraging hashtag use on official social media accounts, or by creating livetweeting events with the show’s stars, networks have taken what were once spaces of independent fan engagement and transformed them. Now, despite not involving any money, we have reason to believe that talking about shows on social media is important to the networks, and conceivably plays into their decision-making once May comes around. Trending is supposed to have merit. Streaming is supposed to make a difference. When these platforms emerged as new metrics for success within broadcast television, it represented a huge opportunity for fans to affect programming decisions. But when NBC started making its May decisions, it canceled Constantine, just as BuzzFeed reported was likely in April as part of a larger fall preview. Fans—and staunch supporter of genre television William Shatner, who pulled Constantine under his still-perplexing wing—attacked BuzzFeed’s Kate Aurthur for reporting the show’s likely cancellation, but this was only because she was preparing them for a harsh truth: At the end of the day, their tweeting and streaming weren’t valued as much as they expected, or as much as the networks led them to believe. Instead, NBC chose to renew only one new series: The Mysteries Of Laura, which had comparable demographic ratings, and significantly less social media and streaming engagement. Of course, it also had twice as many viewers. Historically speaking, this is not a surprising development. The year that CBS canceled Jericho, the network held onto a number of aging procedurals that made minimal impact on the internet, but drew stronger numbers in the traditional Nielsen ratings. But part of the purpose of fan campaigns was to demonstrate that the Nielsen ratings are a flawed system: Very few of the fans spending their time posting online or mailing items to networks are part of Nielsen households, meaning there’s a likelihood the system isn’t truly counting them. In the past, spaces like Twitter were ways to give fan support a signal boost; today, they are also spaces where fans know their support will be counted. In 2013, Nielsen launched Twitter TV Ratings, providing networks with a measure of how many people are tweeting about their shows, data that’s more certain than the company’s estimates of audience size. As one of Hulu’s co-owners, NBC would also be fully aware of how many people streamed Constantine, and would have a much more precise number than what Nielsen delivers. 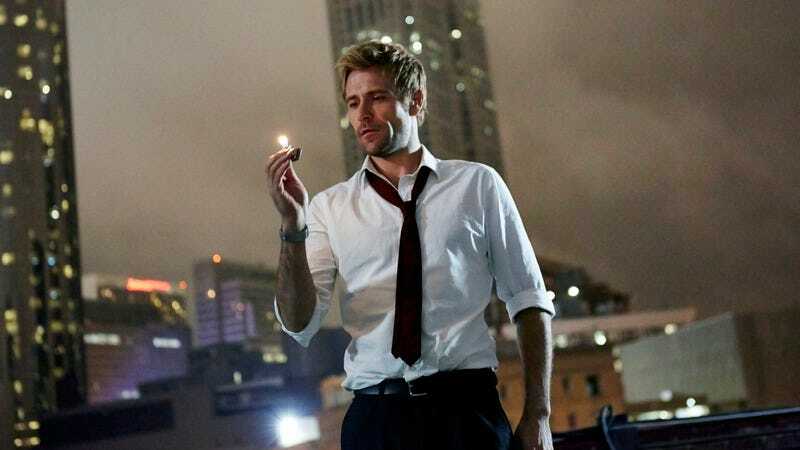 The “Save Constantine” movement turned to the internet proactively to translate fandom into “social media engagement” and “multi-platform viewing,” terms that the broadcast networks have begun to value and quantify. Yet Constantine was still canceled, and I’d argue it hurts more than ever before. In the past, one could at least believe that networks were acting out of ignorance: They didn’t know how many fans were posting on message boards, because there were no ways of measuring that activity. Once fans of Chuck and Jericho translated that fandom into something that the networks understood, they reversed their decisions. But in this circumstance, NBC had all the information. They had the Twitter ratings, they had the streaming statistics, and they were in the room when Cerone pulled out that cell phone to show that fans were tweeting #SaveConstantine. But despite all this information, they chose to cancel it anyway, and that has to hurt for the show’s fans, who felt their actions meant more than they ended up meaning in the end. The maturation of platforms like Twitter has made it so these decisions seem decidedly less final: Like State Of Affairs star Katherine Heigl, Cerone assured fans that his show was seeking a new home, with Shatner helping launch a campaign to get Constantine picked up by The CW. The campaign even roped in Arrow star Stephen Amell, who promised to guest star if the show were to be picked up for a second season, while other rumors potentially see the series heading to Syfy or even Fox (where DC Comics just had Lucifer picked up to series). There are challenges to all of these plans (lower budgets, packed schedules), but chief among them is the fact that the show’s original network had a significant amount of data on fan engagement and still chose to pass. But such hope comes with the possibility of greater pain. Social media has made forging relationships with television shows easier than ever: Viewers connect with stars, producers, and other fans when live-tweeting the show, building communities that endure through constant connection. This community can shape our engagement with the show for the better, but it also makes it that much tougher when the show is canceled and the value of that community is contradicted by the network that helped create it. Nearly every television show has some semblance of this community. There would have been a (smaller) Twitter campaign to save The Mysteries Of Laura if it had been canceled, and searching Twitter reveals at least a small group of people mourning every show that got caught up in this season’s broadcast bloodbath. However, when you’re a fan of a show that has a substantial community, and you’ve been given the impression this fan community has value, and producers have told you that engaging in a particular way is going to make a difference, and it turns out that it wasn’t valued in the end—that’s a different kind of painful. And it will only become more common as networks continue to cultivate online followings faster than executives understand their worth, leaving shows like Constantine to (likely) die as social media success stories and television failures.